With Grantham’s 250th Anniversary here, it’s time to celebrate with a Scavenger Hunt! Let’s cut to the chase: The Scavenger Hunt is a photo scavenger hunt, aiming to get you to explore and take photos of some of Grantham’s unique sites and resources. The first 100 people to complete the hunt win a prize: a 1″ enamel pin of the Grantham Town Seal! So far, 12 pins have been awarded! June was hot and humid, so a lot of folks didn’t really get out as much as we hoped, so we’re extending the contest until Labor Day (or we run out of pins). Get exploring! The Great Grantham Scavenger Hunt is brought to you by a combination of the Grantham Conservation Commission and the Grantham Historical Society as part of Grantham’s 250th Anniversary Celebration. We’ve even got prizes (while supplies last)! 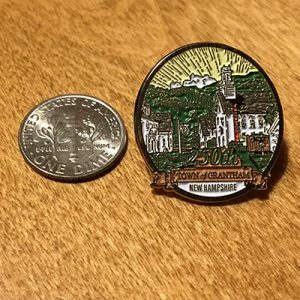 The first 100 Grantham residents to get at least 30 points will receive a 250th Anniversary Grantham commemorative 1″ enamel pin! Questions? Concerns? Need a hint? Contact us at puzzle@granthamscavengerhunt.com !